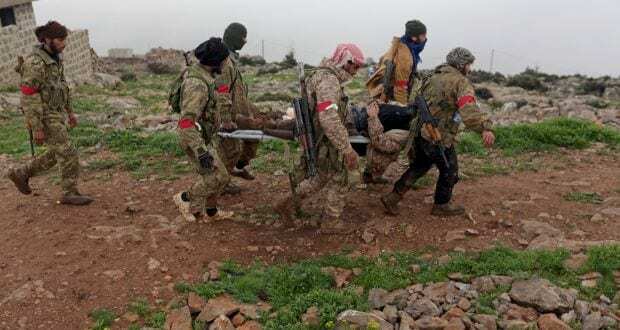 Turkish-backed Free Syrian Army fighters carry a wounded colleague in Afrin, Syria. When the YPG/PKK terrorists sustained heavy losses in the skirmishes, the PKK commanders, who had been dispatched by Kandil to assist Afrin, fled the city and headed towards al-Raqqah and Manbij. Following the senior commanders’ flight, the rest of the terrorist militants quickly disbanded as well, joining in the collective escape. Throughout Operation Olive Branch, a total of 4,000 terrorists were neutralized. The YPG/PKK, which had been brought forward as the USA’s so-called chief actor in the fight against DAESH with an allegedly undefeated streak in the region, turned out to be nothing but a big, over-inflated balloon. Specializing in areas such as terrorizing civilian populations, ethnic cleansing, extortion, looting, pillaging and smuggling rather than real military prowess, the terrorists of the YPG/PKK proved utterly impotent in the face of the Turkish army and FSA forces. Right from the onset of the operation, certain Western media outlets reported various speculations regarding Operation Olive Branch, laying particular emphasis on the prospect of Turkey’s failure. However, the control of Afrin being wrested in such a short period of time followed by the purging of the city and its surroundings from all terrorist elements have disproved many analyses on the issue, and invalidated the arguments on how Afrin would turn into some sort of ‘Vietnam’ for Turkey. For example, the Independent newspaper journalist Patrick Cockburn’s predictions on the YPG/PKK launching a powerful counterattack against the Turkish army in Afrin and Turkey’s eventual failure in the operation offered a brief glimpse of the Western media’s stance on the operation. In response to the Turkish Army’s decisive and successful advance in the Afrin campaign, the said press this time has resorted to fake news and black propaganda. The false reports alleging that Turkey was targeting civilians, hitting hospitals, and perpetrating massacres and genocide began circulating in the same media organizations. Attempts were made to back this fake news by bogus interviews held with dubious individuals. Moreover, the use of civilians as human shields to save their own lives, even forcefully relocating the civilians in the surrounding villages into the Afrin city center are some of the inhumane practices YPG/PKK resorted to during the Afrin campaign as also confirmed by the UN. In fact, Farhan Haq, one of the UN Secretary General’s spokespersons, noted in his statement on February 6 that the YPG/PKK was imposing a blockade on Afrin, not allowing civilians passage to safe areas. Lowcock, the Assistant Secretary General of the UN, said in his statement on February 28 that the terrorist organization was preventing civilians’ access to safer regions. On the other hand, by ensuring that the aid convoy sent by the Red Cross for 50 thousand civilians safely arrived at its destination, the TAF once again demonstrated its sensitivity for civilian life. In the end, Operation Olive Branch was carried out in a manner that reflects the moral values, customs, traditions, superior conscience, and guiding principles of the Turkish nation and the Turkish army. With great consideration for the safety and security of all innocent civilians, women, children and the elderly alike. The operation was brought to a successful conclusion by solely targeting the terrorists and their positions, hideouts, supplies and equipment. The disinformation and black propaganda efforts made by the YPG/PKK and certain media outlets supporting this terrorist organisation as a part of their propaganda operation utterly lack any sound, factual basis.